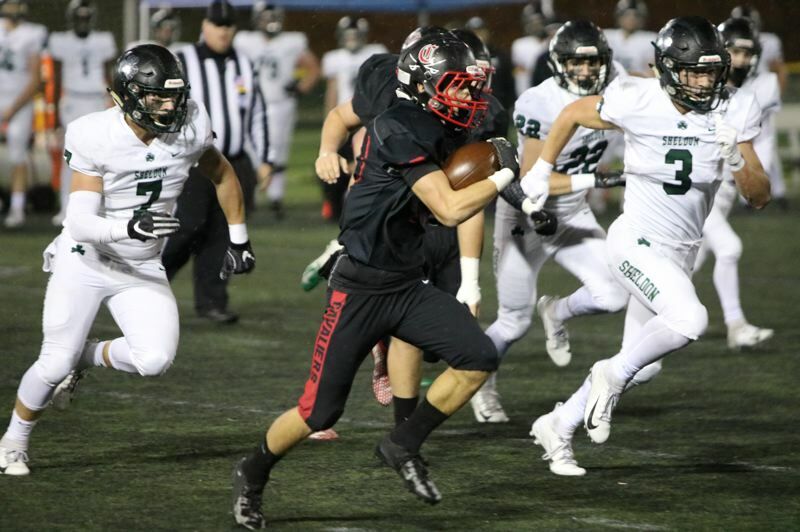 The Clackamas Cavaliers met their match on Friday night. Sheldon backup quarterback Griffin Line guided three second-half touchdown drives that carried the Irish to a 35-14 victory over Clackamas in Friday's OSAA Class 6A football semifinals at Hillsboro Stadium, ending the Cavaliers' season at 12-1. Tied at 14-14, Sheldon's Jack Folsom scored the go-ahead touchdown on a 39-yard pass from Line with 6:22 remaining in the third quarter as the Irish knocked off the defending state champions and advanced to next week's final to face Lake Oswego, a 24-14 winner over Jesuit in Friday's other final. "We played as a team and everyone did their part," Sheldon coach Josh Line said. "Clackamas is a really good football team. We knew we'd have to get a couple of breaks and execute really well, and we were able to do that. "It's a pinch-yourself moment, there's no doubt about it. But we believed we could get here and we did the work and … this is where we always wanted to go." The Cavaliers, who came into the game riding a school-record 26-game win streak over two seasons, saw their bid to become the first big-school program to go undefeated in back-to-back seasons since Roseburg in 1995 and 1996 come to an end. "I'm disappointed," Clackamas coach Joe Bushman said. "Even though I didn't think we played particularly sharp, we still were 14-14 and right in the thing. In those situations the last few years, we've been really good. "We've been in a lot of close games in the fourth quarter and we've usually been the team that pulls them out, but not tonight. Give Sheldon credit. They're a really good football team." Sheldon (11-2) seized the early momentum when they took the opening kickoff and went on a 13-play, 80-yard scoring drive that ended with quarterback Michael Johnson Jr, throwing a 15-yard touchdown pass to wide receiver Gunner Robinson with 6:17 to play in the first quarter. Clackamas' first drive lasted only two plays and ended when quarterback Caleb "C.J." Jordan threw a backward pass to wide receiver Jack Dollens, who then tried to throw the ball back to Jordan, only to see Sheldon linebacker Dylan Dowling intercept the second pass at the Cavaliers' 25-yard line. "We thought we'd catch Sheldon amped up and get them to pursue the football, but they didn't," Bushman said. "They stayed home and we probably shouldn't have thrown it. "We saw Centennial run that play and we kind of stole it from Centennial. I don't know if we rushed it … I've got to see it on film, but, obviously, it put us in a hole early." Less than a minute later, Johnson, the Penn State-bound quarterback, scored on a 6-yard run to push the Irish lead to 14-0 with 4:44 remaining in the first quarter. Clackamas climbed back into the game when slot receiver Jailen Hammer scored on a 12-yard run with 4:44 left in the second quarter, and then wide receiver Richard Kennewell caught a 60-yard touchdown pass from quarterback Austin Atkeson on the second play of the third quarter that tied the score at 14-14. On Sheldon's next drive, Johnson got shaken up at the end of a short run and had to leave the game with 8:39 to play in the third quarter. Enter Griffin Line, the junior backup quarterback and the coach's son, who put the Irish back in front four plays later when he connected with Folsom on a 39-yard touchdown pass that made it 21-14. "After we made it 14-14, I really thought we were going to win the football game," Bushman said. "I thought we had al the momentum. Then their quarterback goes down and their backup came in and ran their offense flawlessly. "He did a really good job running their zone read. I don't say he ran it better than Johnson, but he read it really well and then their line started to wear on us a little bit." Sheldon put the game away in the fourth quarter when running back Matthew Burgess scored on a 12-yard run to cap a 10-play, 79-yard drive with 7:23 to play, and then Line scored on a 24-yard run at the end of a five-play, 73-yard drive with 2:16 left. "We made adjustments at halftime and came out swingin', and they made their adjustments and come out stronger than we did," Cavaliers senior defensive end Justice Pagan said. "They just played an all-around good game and I don't think we were prepared enough. "Sheldon is a good team. They have a good offense. Michael Johnson Jr. is a helluva player, and so is Patrick Herbert. They just wanted it more than us. That's all it took." Clackamas had the ball only five times in the second half. The first drive ended with the touchdown that made it 14-14, the second drive ended with a punt, the third drive ended when the Cavaliers failed to convert on fourth-and-3 at the Sheldon 23, the fourth drive ended when they failed to convert on fourth-and-2 at the Sheldon 15, and the final drive ended with an interception with less than a minute to play. "I love my teammates for keeping their heads up and fighting hard," Cavs' senior center Alex Hall said. "We didn't execute the way we needed to, but we fought hard and I'm very proud of our guys for that. Sheldon ran 62 plays and gained 382 yards total offense – 229 yards rushing and 153 yards passing. Clackamas ran 65 plays and had 310 yards offense – 88 yards rushing and 222 yards passing – but struggled in key situations, converting 2 of 14 third-down situations, and 4 of 7 fourth-down plays. "I thought we played really hard," said Thomas Tolonen, the Cavs' senior wide receiver and defensive back. "Some plays didn't go the way we wanted them to, but at the end of the day, we can't change it. I wish we would have come out on top. "I really thought we had a chance to pull it out. We were all hyped up on the sideline, but Sheldon is a good team … a really good team. We made some mistakes and it just happened to come out not how we wanted." Atkeson completed 12 of 22 passes for 148 yards, while Jordan completed 5 of 12 passes for 74 yards and had nine carries for 21 yards for Clackamas. Anthony Talavera was the Cavs' leading rusher with seven carries for 44 yards, and Kennewell was the top receiver with a game-high six catches for 129 yards. "It's disappointing that we lost, but Sheldon is a good team," Kennewell said. "They have that many weaknesses. We tried to stop their run game. That was our main focus this week, but we weren't able to do it. That killed us." Senior inside linebacker Jake Bushman led the Clackamas defense with a game-high 14 tackles, Pagan added 10 tackles with a game-high five tackles for loss, and Hammer finished with seven tackles. "Give Sheldon credit," Jake Bushman said. "We didn't make the plays when it matter. We usually have a good run defense, but they ran downhill against us at times tonight. "We definitely didn't accomplish what we set out to do, but we have such a special group. Our senior class struggled in youth football growing up, but to see us be successful throughout high school is a special thing in and of itself." Friday marked the final game for Clackamas' 22 seniors, who were part of a program that over the past four seasons compiled a 45-7 record and won three consecutive Mt. Hood Conference titles. They also reached the state semifinals three years in a row and won one state championship a year ago. "There were four teams in the semifinals with a legitimate chance to win the state championship this year," Joe Bushman said. "To be in this position for three straight years, it's really a testimony to the kids and their off-season commitment to the program. We don't take that for granted. It's hard to get here. "The seniors are pretty torn up, but when they look back, I think they'll feel good about what they accomplished." Added Pagan: "To win 26 straight games is nothing this school and this community has ever seen before and I couldn't be more proud of these guys. All these guys are my brothers and I love every single one of them. We played our hearts out. We just didn't get the result we expected."